The Treasury at Petra in Jordan is among the popular travel destinations for empty nesters. “Jamal means ‘camel’ in Arabic, and jameel means beautiful — be careful not to confuse them when you wish to compliment someone!” Wise words from tour guide Mohammed Assaf in Jordan, especially considering that our camel resembled the villainous Jafar from Disney’s “Aladdin.” This convo took place around the fire in a Bedouin-run luxury tent camp in Wadi Rum, the desert outpost made famous by T. E. Lawrence, a.k.a. “Lawrence of Arabia.” After enjoying a pit-cooked zarb dinner prepared by our Bedouin hosts, we lifted our eyes to the sky for stargazing in one of the least light-polluted places on Earth. The next day, we’d mount jamals for a tour of this russet-hued landscape of wind-sculpted sandstone peaks. The highlight of our trip: two days in Petra, the Rose City, an astonishing archeological site of caves, tombs, and temples carved into the pink sandstone of Jordan about 2,000 years ago. “Petra is a bucket-list destination for many travelers, one that especially appeals to empty nesters, who perhaps backpacked around Europe in their youth and are searching for authentic experiences,” says Darshika Jones of Peregrine Adventures (www.peregrineadventures.com), specializing in small-group tours in 80-plus countries. Jordan isn’t a place you’d take the kids. Exploring it takes some effort. You’ll climb dunes in the desert, bump along in a Jeep, explore castle ruins, and float in the lifeless Dead Sea (and spread its famous mineral-rich mud all over your body). Disney, it isn’t. And that’s precisely why Jordan is becoming so popular with empty nesters. “Surrounded by ‘hot zones’ in the Middle East, Jordan has suffered in the past because of guilt by association,” says Jared Alster of Cox & Kings (www.coxandkingsusa.com), a travel outfitter specializing in cultural and wildlife journeys in 23 countries. 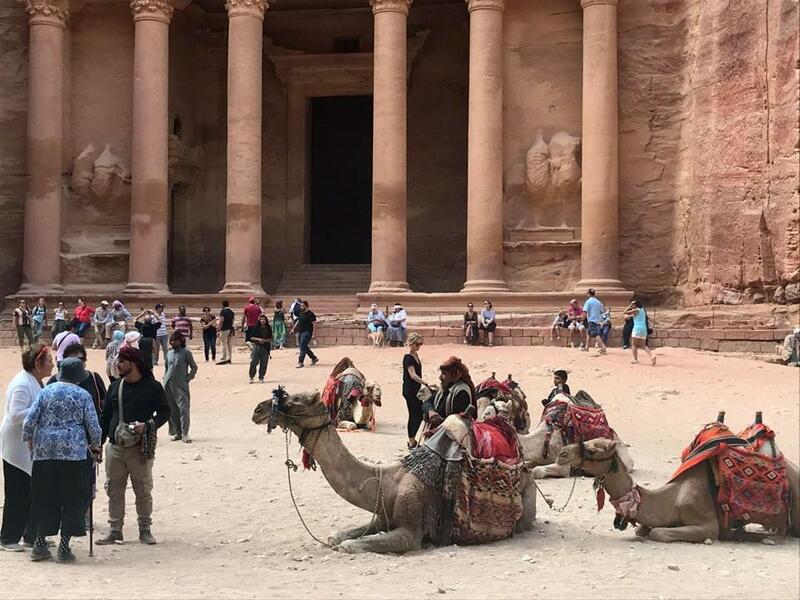 “But the country has seen a resurgence in attracting all types of American travelers, especially boomers who want to experience the Middle East.” Jordan recently cropped up on National Geographic’s top 10 list of places to visit, a sure sign of having arrived. With the possibility of extra time and money now that their kids have flown the coop, empty nesters are keen to travel. According to MMGY Global’s Portrait of American Travelers, 74 percent of baby boomers (ages 53 to 71) took at least one vacation with a spouse or other adult, minus children, in 2018. That’s up from 67 percent last year. Boomers took an average of 2.6 vacations without children, the study reports. About 85 percent of the adults surveyed were empty nesters. Taking a trip to a place you’ve long dreamed about is one way to kick off the next phase of your life. “After years of family trips, and going places suitable for kids, this age group is ready to explore. They’re not afraid to get dirty, or maybe a little uncomfortable, and they want to really get to know a destination as opposed to sticking to the tourist track,” says Jones. Indeed. On our “Jordan Explorer” journey with Peregrine Adventures, we hiked through Petra, from the tunnel-like Siq to the (mind-blowing) Treasury and up to the Monastery, until we didn’t think we could take another step. Turns out that walking straight up sand dunes in dry desert heat is exhausting. We lugged our bags around from hotel to camp to hotel, shaking the red dust out of our sneakers every night. We got bruises on our thighs from the camel. Not to mention a (thankfully short) bout of intestinal distress, which is a fairly common experience among tourists here. And we’d happily do it again. On our next visit to Jordan, we’ll explore the 400-mile Jordan Trail, a newly launched trekking path along ancient trade routes. Anyone who thinks empty nesters aren’t up for action should have a chat with James Moses, of Boston-based, not-for-profit Road Scholar (www.roadscholar.org), the source for 5,500 learning adventures in 150 countries: One of the company’s most popular trips is an 11-day multisport adventure in Costa Rica, featuring kayaking, rafting, hiking, and Latin dance lessons. Here are a few other places that are hot right now with the fit, adventurous empty-nester tribe. This region, including Kerala and Karnataka states, is gaining in popularity among the empty nester demographic. “Many boomers traveled through North India and Nepal during the 1970s on the ‘hippie trail,’ but few made it to the south,” says Alster of Cox & Kings. “The south is breathtakingly beautiful, with a climate and landscape more like Southeast Asia — lots of greenery,” he says. Accommodations have improved vastly over the years in that region, he adds, including luxury tent camps. For many folks, Africa is the trip of lifetime. “It’s not a cheap destination, especially at the luxury end of the market, but is a truly special place, whether you opt for a traditional safari through the Serengeti, or something off the beaten path, like the Selous Game Reserve in Southern Tanzania,” Alster says. Tanzania is coming on strong as a favorite with Cox & Kings clients thanks to the wildlife-rich Serengeti, plus Mount Kilimanjaro, the tallest freestanding mountain in the world, and the white-sand beaches of Zanzibar. At Peregrine, the “Botswana Experience” is a popular choice; itineraries feature Botswana and travel through Namibia and Zimbabwe. Of course there are game drives into national parks, but “guests also sleep on a houseboat on the Okavango Delta and spend time with Kalahari First Nations people, elements that appeal to the intrepid empty nester,” Jones says. Most boomers who’ve traveled have done Western Europe, including the United Kingdom, Spain, France, and Italy. “But for much of their lives, Eastern Europe, including the Baltic countries of Latvia, Lithuania, and other Eastern Europe countries like Poland, were under Soviet rule or too close for comfort,” Alster notes. With the Cold War far behind us, empty nesters are exploring these places — teeming with history but with fewer tourists than Western Europe — for the first time. One of the top two international destinations for empty nesters on Road Scholar trips (along with Cuba), Costa Rica is renowned as one of the world’s most beautiful and bio-diverse countries. “Guests want to experience this beauty first-hand and learn about this extraordinary country from experts and naturalists, he adds — and discover ‘pura vida’ for themselves,” Moses says. “Peru is a perennial favorite among boomers and has become increasingly popular because of the emergence of Lima and Cusco’s culinary scene,” Alster says. Lima is now ranked as one of the best food cities in the world, and the Sacred Valley is drawing foodie travelers to culinary hotspots like Mil, situated 11,706 feet above sea level. Beyond food, “Peru offers boomers that [desirable] mix of active soft adventure, like trekking, followed by a bit of pampering at hotels,” Alster notes. Peregrine Adventures puts their own spin on a Peruvian adventure, offering a community-based tourism project in Lake Titicaca, a visit to the catacombs beneath Lima, and a stay in a jungle lodge on the Amazon. They’re big, bold, and beautiful; no wonder our national parks lure travelers. Road Scholar’s learning experiences in the national parks are a favorite destination in North America for baby boomers-slash-empty nesters, Moses says, since they are high-energy, active itineraries. Forget invented-for-Instagram creations like the Museum of Ice Cream; this group wants to take selfies and experience first-hand some of the world’s most wondrous monuments. “Many of Peregrine’s clients have these places on their wish lists,” Jones says. Beyond Petra, they include the Great Wall of China, the Taj Mahal, the Colosseum, the Christ the Redeemer statue, Chichen Itza, and Machu Picchu. To lessen the impact and keep crowds at bay, the company arranges itineraries that stray off the tourist track as much as possible, using local guides and unique lodgings that promote interaction with the people in these communities. In Rome, for example, guests tour the newly restored Colosseum, but they also join a local shopkeeper for a pesto-making class, visit a family-owned organic winery, and stay in a former medieval monastery in Chianti. Looks like the kids aren’t the only ones leaving the nest.